eaHELP connects fast paced companies with talented Virtual Assistants who are able to work remotely from all over the United States. eaHELP has a christian foundation that focuses on having a heart of gratitude, being a servant and Glorifying God. eaHELP looks for experienced individuals who are able to manage multiple projects and deadlines. Virtual Assistants working for eaHELP need to be able to adapt to a changing environment and solve problems quickly. Being up to date on the latest internet trends and apps is a plus. Virtual Assistants collaborate with senior leaders from all industries. They work with everyone from Physicians, Authors, Attorneys, to Pastors, Franchise Owners, and many other busy leaders and managers. Editing and Proofreading, email Management, Software Updates, Returning Calls and Voicemails, Travel Planning, Dictation, Event Planning, Mail Screening & Forwarding, and Expense Reports. On average, virtual assistants work with 1-2 clients at a time. As a Virtual Assistant, you will be the main contact for the client via telephone or email, and may be required to research new initiatives and processes. Virtual Assistants are 1099 contractors and do not receive benefits. This also means taxes are not withheld from your pay, so consider setting aside roughly 30% on your own. Your tax accountant can look at your unique situation to give you the best advice. Hours at eaHELP as a virtual assistant are very flexible. However, you will be required to be available during normal business hours unless your client’s needs deem otherwise. The flexibility here gives you a great Work/Life balance- especially for families with children. eaHELP values family and therefore, make a great match for many work at home moms and dads. eaHELP offers a competitive pay rates. The average pay scale is not made public and most likely because it varies. Variables could include client needs and assistant experience/expertise. Although eaHELP prefers to not make an official declaration of the pay range- I’ve been able to confirm that the pay is equal to or greater than many of the other VA sites such as Time Etc, Fancy Hands or Zirtual. eaHELP prefers that Virtual Assistant applicants have a bachelor’s degree and at least five years of experience as an executive assistant or in a similar role. You will also need to know how to work effectively with managers, remote team members, and virtual teams. 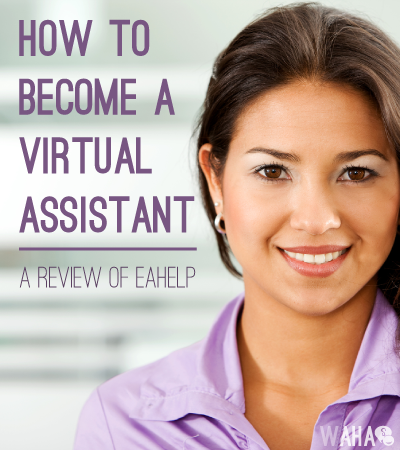 Visit eaHELP online and Apply to be a virtual assistant. Once your application and resume are approved, you will be entered into a database where executives can view your information. You will be matched with the client that best fits your skills. SHERRY: Thank you for reviewing our company (eaHELP). You did a good job to summarize our company, our heart, and what we stand for. We love serving our clients well … and equally love giving people the opportunity to have a legitimate, work-from-home job as well. I appreciate the opportunity to be highlighted on your site. Grateful.